Three HepsNation athletes competed at the 2017 IAAF World Championships in London in the last few days. Kate Grace made it through to the semifinals of the 1,500m, advancing as a time qualifier after she finished 7th in her Friday preliminary round heat with a time of 4:04.76. Her time was the 15th fastest out of the preliminary round. The top six in a given heat earned automatic berths. Unfortunately, she was not able to replicate that performance in the Saturday semifinals. She finished 11th in her semifinal heat with a time of 4:16.70, missing the final cut-off by almost 11 seconds. Her preliminary round time would have been good enough to advance to the final. 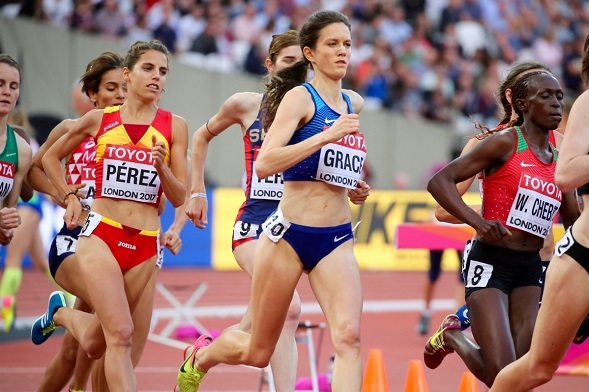 The Rio Olympian admitted in her post-race interview that she is not used to “running the rounds” of the 1,500m but she plans to use this meet as a learning experience so she can become a better 1,500m runner. Other Heps-action to date at Worlds was out in the field events. Julia Ratcliffe was in the women’s hammer throw qualification round on Saturday morning. She got three legal throws in – her best being 64.72m – but it wasn’t enough to advance to the finals as she ultimately finished 26th in the 32 person field. She would have needed to throw farther than 70.33m in order to advance. Over the women’s triple jump qualification, Nadia Eke fouled on her first attempt and then got progressively better on her final two jumps. Her best distance, 13.54m, was the 23rd best mark in the 26 person field. A mark of 14.07m or better would have made it to the finals. Heps-action over in London will resume on Wednesday with the men’s hammer qualification round with Rudy Winkler, followed by the men’s 1,500m preliminary round with John Gregorek and Robby Andrews on Friday. Akua Obeng-Akrofi will be the last Heps woman competing in London as she will be in the Ghana line-up for the 4×100 relay on Saturday. This entry was posted on Sunday, August 6th, 2017 at 1:13 pm. It is filed under Alumni, Featured, Spotlight. You can follow any responses to this entry through the RSS 2.0 feed.